Some college students decide to take short breaks from school in order to travel abroad or make some extra money. But Tyler Gage took a hiatus from his studies at Brown University for an entirely different reason — to live in the Amazon jungle among the Shipibo people. It was his knowledge of those plants that eventually led to him starting his business, RUNA. 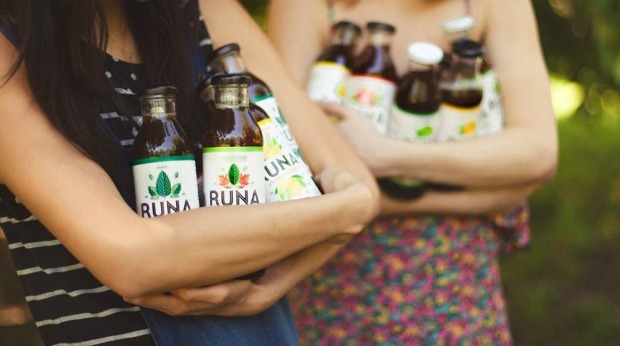 The company produces beverages, mainly tea and energy drinks, made with guayusa, a plant that grows in the Amazon and contains the same amount of caffeine as coffee, but with double the amount of antioxidants as green tea. So the company’s goal is to give farming families in those South American communities a way to use their land’s resources in a way that’s both profitable for them and sustainable for the environment and culture. Instead of simply going in and harvesting the resources and moving on, the company gives local farmers an outlet for their guayusa that is actually long lasting. And that means they have more opportunity to afford the things they need while still maintaining their own customs and practices. Neither Gage nor his business partner, Dan MacCombie, had any business experience prior to launching RUNA. But they actually think that lack of experience has been an asset, since it allowed them to keep an idealistic view when developing their business plan and pitching to investors. Running a company with a social mission that sets out to save the rainforest can certainly be profitable. But putting that social mission first isn’t always a great business decision. In this case, however, the company has been able to find success in both its business and social missions so far, even without the traditional business training.